Click the "Year" tab on the main window. Click the "Year" command in the Go menu. The Year View shows an entire year. 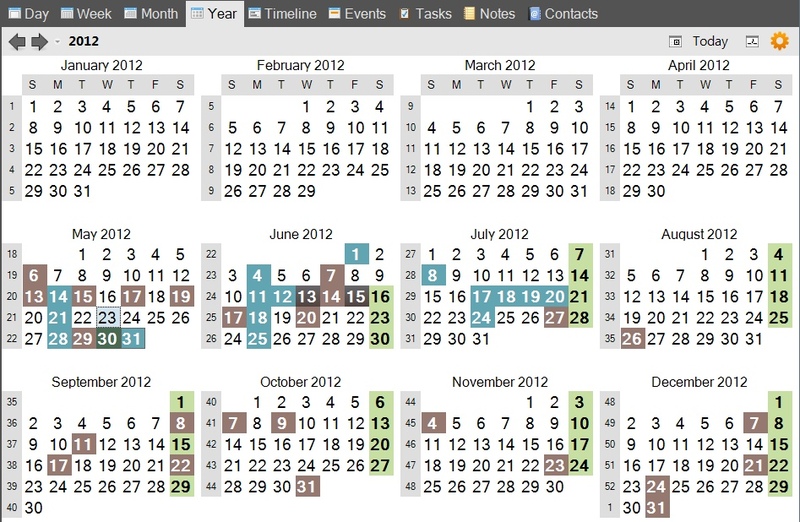 Dates with events are color-coded to match the first visible event occurring on the date. Hovering the mouse over a date will show a summary of that date's items, which can include events, tasks, or notes. To navigate to the previous or next year, use the left or right arrow buttons shown at the top of the Year View. Clicking any date in the Year View will cause the other views in the Calendar View to show the clicked date. To select a date, click it. 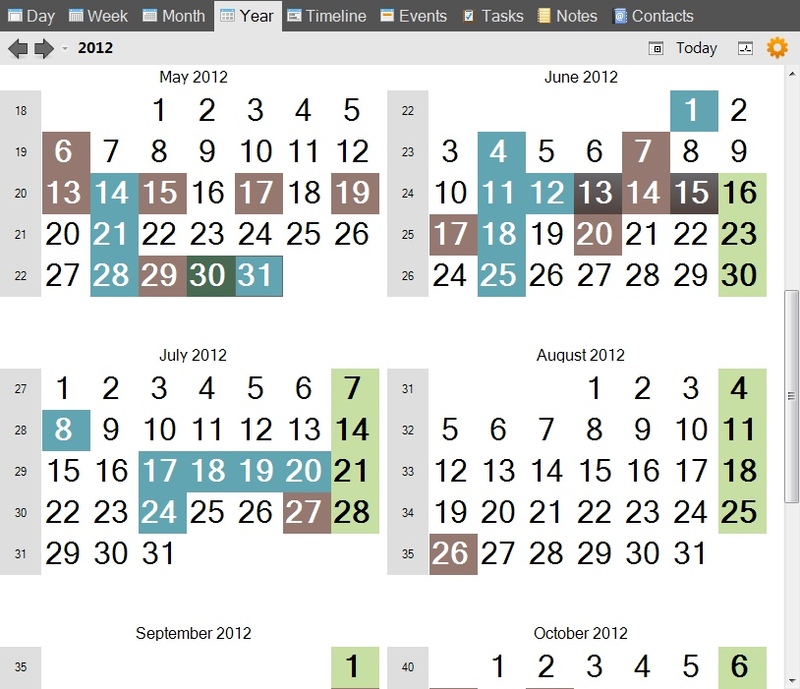 A range of dates can be selected by clicking and dragging. A whole week can be selected by clicking a week number. As dates are selected in the Year View, the other tabs in the Calendar View will automatically update to display the selected date(s). If there are events, tasks, or notes on the selected date, the first item will be also be selected and the Details Pane will update to show information about the item. Click a month name to make the month appear in the Month view. When using the default appearance theme, the current date will be outlined with a gray square and selected dates will be highlighted orange. Dates having one or more visible events, tasks, or notes will have bold date numbers. When the Appearance Option to display dates using event appearances is enabled (the default), dates containing events will be colored to match the appearance of the first event on that date. These colors will also override the orange highlighting for selected dates. Weekend dates will be displayed in black, by default. If you want weekends to be colored differently (such as red), this can be changed via an Appearance Option. The first day of the week will vary depending on your Window's regional settings. For example, in the USA, the first day of the week defaults to Sunday (as shown in the example image above). In the UK, it defaults to Monday. This default setting is a Calendar Option that can be overridden to enable any day to be selected as the first day of the week. Week numbers can be displayed or hidden in the Year View via a Calendar Option. Also, two standards for week numbering are supported - Simple Week Numbering and ISO 8601. Simple week numbering will cause the week containing the first day of the year to always be numbered as 1. This is the standard used in the United States. ISO 8601 week numbering will cause the week containing the first Thursday of the year to be numbered as 1. This is the standard used in Europe. The week numbering standard can be selected in the Calendar Options window. Clicking the "gear" button in the upper-right corner of the Year View will result in a menu appearing where the Year View settings can be modified. When this option is selected, months in the Year View will be arranged as illustrated in the diagram below, where the month numbers are indicated 1 through 12. 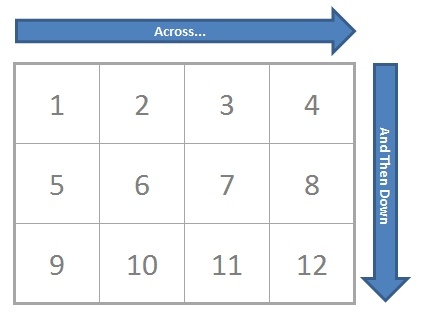 In this diagram, a 4x3 grid is used. When this option is selected, months in the Year View will be arranged as illustrated in the diagram below, where the month numbers are indicated 1 through 12. Again, a 4x3 grid is used. When this option is selected, months will be arranged in a 2 x 6 grid. In other words, there will be 2 columns and 6 rows. 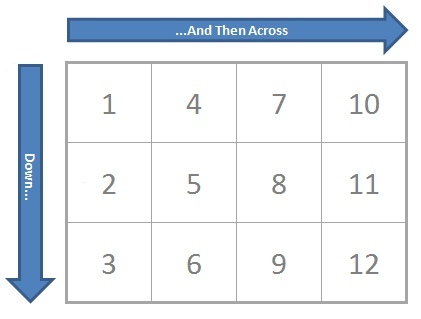 When this option is selected, months will be arranged in a 3 x 4 grid. In other words, there will be 3 columns and 4 rows. When this option is selected, months will be arranged in a 4 x 3 grid. In other words, there will be 4 columns and 3 rows, as shown in the diagrams above. When this option is selected, months will be arranged in a 6 x 2 grid. In other words, there will be 6 columns and 2 rows. The 'Font Size' option expands into a submenu of font sizes. 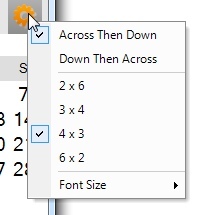 To select a different font size for the Year View, click the desired size in the submenu. In the example below, the font size is set to 24. The grid dimensions are set to 2 x 6. Notice a vertical scrollbar is added.